Riz Khan, host of the “Riz Khan Show” and “One on One” at Al-Jazeera English, discusses what makes news today, and why the Pakistan crisis has not been widely reported on at the Barker Center on Friday. 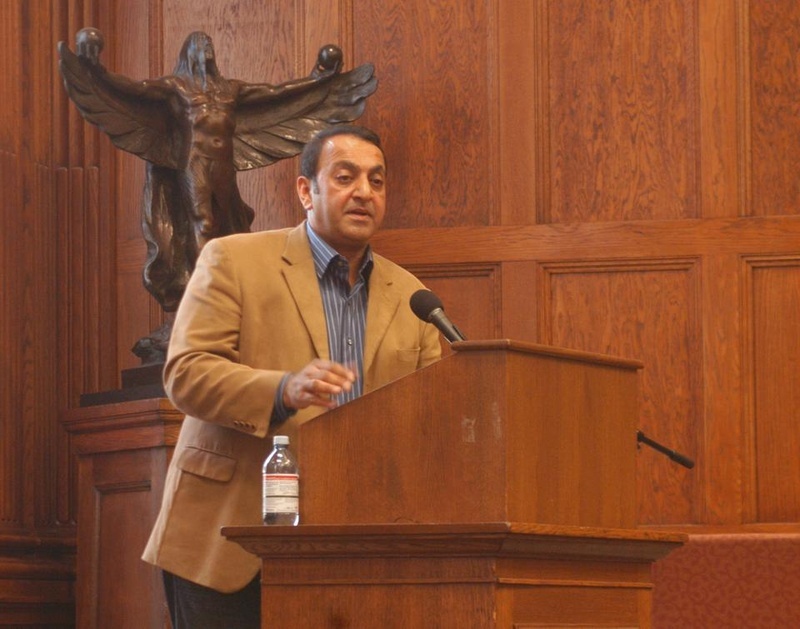 Rizwan “Riz” Khan, the host of an Al Jazeera English program that bears his name, discussed newsworthiness in American and Middle Eastern media outlets last Friday at the Barker Center. Invited by the South Asia Initiative, Prince Alwaleed Bin Talal Islamic Studies Program, Harvard Pakistan Student Group, and the Center for Middle Eastern Studies, Khan—a former BBC and CNN reporter—spoke about the lack of coverage of the catastrophic floods in Pakistan this past July to illustrate editorial choice and how it affects reporting. M. Abbas Jaffer—a student at the Divinity School who introduced and concluded Khan’s talk—added that the Harvard Pakistan Student Group asked for a specific media focus on the recent floods, which affected the lives of nearly 20 million Pakistanis and led to the deaths of almost 2,000. In contrast, “Al Jazeera did have quite a deep coverage,” he continued. Khan, whose father is Pakistani and mother is Indian, said news outlets in the United States frequently look to make an emotional connection with their domestic audience. As a former BBC producer and CNN show host, Khan also reflected on the complex process of choosing certain stories to cover. “There are so many stories vying for importance, and often what’s happening right now is the one that dominates,” Khan said, adding that, due to the spatial distance between the U.S. and Pakistan, reporting on the floods was not a priority for American news. Further comparing Middle Eastern and American news sources, Khan said that news outlets in the United States often blur the boundary between objective reporting and subjective commentary. “In America, people have to have [the news] shoved down their throats,” Khan said. Though Al Jazeera English—launched four years ago—is a 24-hour news channel, Khan criticized the danger of demanding information instantly. Khan turned to a slightly less serious topic when he expressed his support for The Daily Show With Jon Stewart, which he said has championed Al Jazeera in the past.